Today, there is a great piece of news for people who choose to use mobile devices for browsing the Internet. For the first time in the history, mobile internet usage has exceeded desktop internet usage worldwide. In other words, more people get the access to the web from mobile devices these days. The global web statistics that has been recently provided by StatCounter shows that 51.3% and 48.7% of Internet users browse the web from mobile devices and traditional desktop devices respectively. Google has also recently reported that the more its searches are conducted via mobile devices and less its searches are conducted via desktop these days. According to Google’s statistics, more than 100 billion searches a month are generated by mobile users. 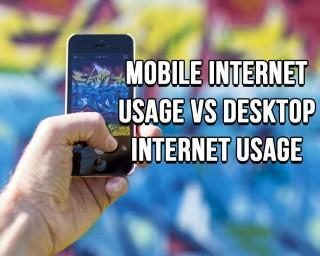 Australia is one of the countries where mobile internet usage has surpassed desktop usage. IAB Australia conducted its own research on mobile internet usage in Australia the last year. The study found that up to 12.5 million Australians used the Internet from their smartphones while 7 million Australians browsed the web via tablets in 2015. On average, an Australian smartphone user spends about 35 hours a month whole an Australian tablet user spends approximately 26 hours on browsing the Internet, according to the latest Mobile Ratings Report. It’s interesting to know that mobile compatibility has become the top priority for more 60% of firms in Australia, according to the statistics provided by IDC in 2015. Australian business owners suggest that there is the direct link between mobile compatibility and their significant revenue growth in 2015. What does all this statistics mean? For business owners, that means that it’s time to make their websites mobile friendly. It’s important to note that a mobile friendly site is not a trend anymore. Keep in mind that a mobile friendly site has already become a necessity. Is your website not mobile friendly? If so, you’ll not receive high amounts of mobile traffic. Your website will lose targeted traffic and, therefore, your business will lose potential clients. Obviously, as a business owner you need to do your best to prevent this from happening. The best thing that you can do is to update your website and make it mobile friendly. You need to know that making a mobile friendly site has multiple SEO benefits. Google has recently announced that the search engine is going to give higher priority to mobile friendly websites. Therefore, if you want to get more traffic from Google then you need to pay a close attention to mobile compatibility. All that means that it’s crucial for you to test your website carefully and make sure that it’s really mobile friendly. Remember, if your site is mobile friendly then it has a good chance to rank high in Google’s mobile search results. Google constantly highlights the importance of having a mobile friendly site for business. The search engine has recently launched a free online tool (known as "Test My Site") that can be used by business owners to check their sites for mobile compatibility. Today, you can use the tool to see how your website looks on mobile devices of different types. It’s also important to note that the tool provides its users with suggestions on how to improve your website and make it mobile friendly. It goes without saying you should use this tool for checking site’s mobile compatibility and make changes to a website if necessary. Another important thing is that Google is planning to provide its users with a mobile-only search index. That means that those people who use smartphones for conducting search in Google will get more up-to-date results. Smartphone users are expected to take advantage of a mobile-only search index in a few months. As you can see, more and more people choose to use the web from different types of mobile devices. Without a doubt, mobile users are making the history of the internet these days. The global mobile internet traffic is expected to grow dramatically in the nearest future. For this reason, responsive web design and optimizing a website for mobile devices are a key part of online marketing strategies today. Making a website mobile friendly means adjusting it to fit all screen sizes. For website owners and online marketers, now it’s time to make big changes! Use the power of mobile compatibility to maximize your online marketing efforts and take your business to the next level!